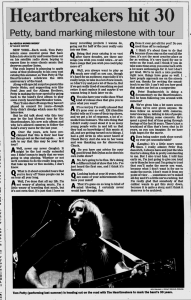 NEW YORK -- Each week, Tom Petty selects some musical gems that have fallen into obscurity and beams them out on his satellite radio show, hoping to expose fans to some classic music that deserves another listen. The rock legend is planning to apply some of that philosophy to his own vast catalog this summer, as Tom Petty & The Heartbreakers celebrate the 30th anniversary of the band. Along with special surprise guests like Stevie Nicks, and supporting acts like Pearl Jam and the Allman Brothers, Petty is making the tour special by going back to the band's first album to play some rarely heard Heartbreaker tunes. 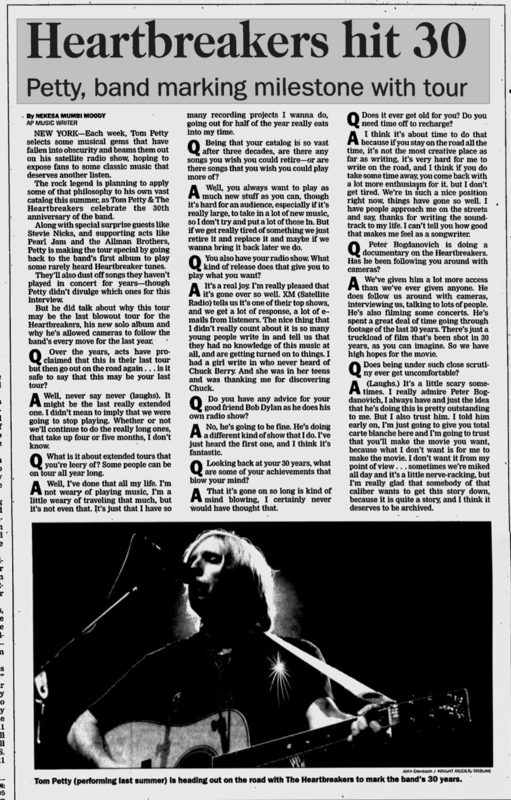 They'll also dust off songs they haven't played in concert for years -- though Petty didn't divulge which ones for this interview. But he did talk about why this tour may be the last blowout tour for the Heartbreakers, his new solo album and why he's allowed cameras to follow the band's every move for the last year. Q: Over the years, acts have proclaimed that this is their last tour but then go out on the road again... is it safe to say that this may be your last tour? A: Well never say never (laughs). It might be the last really extended one. I didn't mean to imply that we were going to stop playing. Whether or not we'll continue to do the really long ones, that take up four or five months, I don't know. Q: What is it about extended tours that you're leery of? Some people can be on tour all year long. A: Well, I've done that all my life. I'm not weary of playing music, I'm a little weary of traveling that much, but it's not even that. It's just that I have so many recording projects I wanna do, going out for half of the year really eats into my time. Q: Being that your catalog is so vast after three decades, are there any songs you wish you could retire -- or are thee songs that you wish you could play more of? A: Well, you always want to play as much new stuff as you can, though it's hard for an audience, especially if it's really large, to take in a lot of new music, so I don't try and put a lot of those in. But if we get really tired of something we just retire it and replace it and maybe if we wanna bring it back later we do. Q: You also have your radio show. What kind of release does that give you to play what you want? A: It's a real joy. I'm really pleased that it's gone over so well. XM (Satellite Radio) tells us it's one of their top shows, and we get a lot of response, a lot of e-mails from listeners. The nice thing that I didn't really count about is it so many young people write in and tell us that they had no knowledge of this music at all, and are getting turned on to things. I had a girl write in who never heard of Chuck Berry. And she was in her teens and was thanking me for discovering Chuck. Q: Do you have any advice for your good friend Bob Dylan as he does his own radio show? A: No, he's going to be fine. He's doing a different kind of show than I do. I've just heard the first one, and I think it's fantastic. Q: Looking back at your 30 years, what are some of your achievements that blow your mind? A: That it's gone on so long is kind of mind blowing. I certainly never would have thought that. Q: Does it ever get old for you? Do you need time off to recharge? A: I think it's about time to do that because if you stay on the road all the time, it's not the most creative place as far as writing, it's very hard for me to write on the road, and I think if you do take some time away, you come back with a lot more enthusiasm for it, but I don't get tired. We're in such a nice position right now, things have gone so well. I have people approach me on the streets and say, thanks for writing the soundtrack to my life. I can't tell you how good that makes me feel as a songwriter. Q: Peter Bogdanovich is doing a documentary on the Heartbreakers. Has he been following you around with cameras? A: We've given him a lot more access than we've ever given anyone. He does follow us around with cameras, interviewing us, talking to lots of people. He's also filming some concerts. He's spent a great deal of time going through footage of the last 30 years. There's just a truckload of film that's been shot in 30 years, as you can imagine. So we have high hopes for this movie. Q: Does being under such close scrutiny ever get uncomfortable? A: (Laughs.) It's a little scary sometimes. I really admire Peter Bogdanovich, I always have and just the idea that he's doing this is pretty outstanding to me. But I also trust him. I told him early on, I'm just going to give you total carte blanche here and I'm going to trust that you'll make the movie you want, because what I don't want is for me to make the movie. I don't want it from my point of view ... sometimes we're miked all day and it's a little nerve-racking, but I'm really glad that somebody of that caliber wants to get this story down, because it is quite a story, and I think it deserves to be archived.